When I discovered Nonviolent Communication (NVC) in 1993, I had no concept of the rich world that would open up to me over time. My intellectual and moral lenses were transformed beyond recognition through this encounter with NVC. When I thought of what to write my Ph.D. dissertation about, NVC informed me every step of the way as I critiqued, then offered alternatives to, theories of human nature that we have been handed down through millennia of Western Civilization. I found satisfying ways of articulating a perspective rooted in NVC, which transcended and integrated the age old dichotomy of reason and emotion and offered a theory of human nature grounded in human needs. Unlike just about anyone I ever met, I loved writing my dissertation and was sad to be done. It’s only in the last couple of years, ten years after completing my dissertation, that I have come back to writing. Immersing myself in NVC also became my calling. Many people don’t know that I used to be a computer programmer in a software house in NY, working on IBM mainframes. I was still doing part-time computer consulting when I stumbled on NVC. Two years later, when I had a deep visceral experience of the transformative power of NVC-based empathy, I decided on the spot to focus my life energy on bringing this gift to others. NVC is my livelihood, it grounds my vision for how the world could be, and affects every thought and interaction that I am conscious of. At the heart of these massive changes was the transformation of my own thought process, understanding, and style of interacting with others. Early on I took on what I now name the path of vulnerability, my main access to inner and outer transformation. Fewer and fewer things get me off balance as I continue on this path. I can meet more and more people and situations with presence, clear choice, and tenderness. I can open my heart to almost everyone in almost every circumstance, even if not immediately. I can accept almost everything that happens to me (not yet in the world at large). Life hasn’t become less painful, because the gap between vision and reality remains big, both personally and globally, and because I continue to feel lonely despite everything. With, through, and despite the pain I am more at peace, more open to life and to myself, more available. I like who I have become. For many of these years, even though I was conscious of the name, I was conspicuously ignorant of the tradition of nonviolence from which NVC emerged. 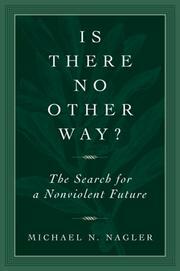 For a long time I was one of the people who thought that “nonviolent” was a negation and wished for a different name. I don’t remember exactly how all this shifted, how my world exploded and expanded. Three milestones were Michael Nagler’s Is There No Other Way, Walter Wink’s The Powers That Be, and the movie A Force More Powerful (a book by the same title also exists). Some bottom fell from under me, and I found myself in a much bigger ocean of meaning and possibility. What it means to be human became larger. Nonviolence became bigger than communication. Gandhi’s notion that nonviolence extended to our thought, word, and action began to make sense. Especially understanding how much our thoughts were implicated in our words and our actions. This exploration has been so rich, that I still make new discoveries just about any time I teach any part of this work, most of the times when I write, and even when I interact meaningfully with others about any of the deep questions that fuel my quest. Whereas I used to be concerned about the “Nonviolent” part of NVC, nowadays I am in love with that word, and my concern has shifted to the “Communication” part of NVC. I no longer think of NVC as primarily about communication. I think of it as a deep and endlessly concrete practice of nonviolence with applications in most areas of human life, such as our spiritual life, our moral codes, how we interact and collaborate with ourselves and each other, and how we can create organizations and even larger systems that are designed to support human needs. This is not nearly an exhaustive list. And what is nonviolence, then? For me, nonviolence is the coming together of love, truth, and courage in a fierce commitment to what my tradition of birth, Judaism, calls Tikkun Olam: the healing and repair of the world. In small or large measure, nonviolence for me is about finding the courage and love to bring truth in times when what is happening is violating our values and interfering with our own or others’ human needs. It’s the willingness to stand up for what’s of value to us while remaining open-hearted towards those who see things differently. It’s the antidote to the consciousness of separation, scarcity, and powerlessness that leads almost all of us almost all the time to go along with systems and practices we know don’t serve life. I am excited, after all this extensive exploration and study over years, to offer a first course (a four session telecourse starting this Thursday at 4pm Pacific Time, open to anyone, through NVCA) that explores the relationship between NVC and nonviolence. I am imagining it as an opportunity for nonviolence enthusiasts to learn about NVC as a practice that can enhance their path, for NVC enthusiasts to learn about the tradition and context that can give a new layer of meaning to their practice, and for both to learn from each other. It matters to me, because the only way I can imagine to reach a livable future for all is based on nonviolent means. Light, light, light, and more light, expansion, possibility, wisdom, hope….all of these come through as I read this..
Yours is the only blog I read, or have ever read. I know we share something very deep in common. I often want to share with you my way of expressing what you and I both believe. Once before I started and discarded a long letter to you.